Inspired by skipper Conor McManus, Monaghan won their 16th Ulster football title with a 0-11 to 0-10 win over holders Donegal at Clones. Monaghan fired over five points in the last ten minutes of the first half, with McManus kicking his fourth, to go in at the break with a 0-8 to 0-4 lead. Paddy McBrearty brought Donegal back into it with free kicks, and despite failing to score in the final 24 minutes, the Farney men held on, with McManus claiming a six points haul. Donegal were two points to the good after just two minutes, Paddy McBrearty finishing the first, and setting up the second for the overlapping Karl Lacey. 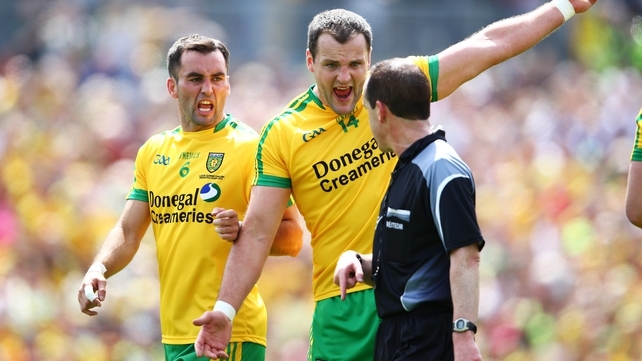 McManus and Kieran Hughes were both double-teamed while within scoring distance, Donegal’s defensive system looking more intricate than ever in the early stages. 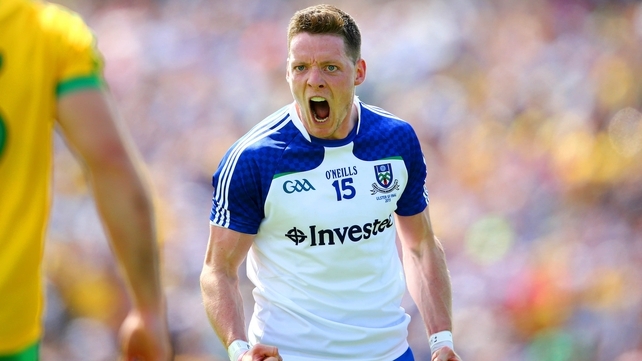 But Monaghan figured out a way to dismantle the game’s most feared rearguard. Wing back Karl O’Connell was the first to break the cordon to send over a tidy point, after Conor McManus had converted a free. And it was McManus who brought the sides level from a free in the 15th minute, after Paul Durcan had raced off his line to deny Dermot Malone. After absorbing a spell of sustained pressure, Monaghan broke to go in front for the first time in the 26th minute through Owen Duffy. Stretching their opponents by playing with width, Monaghan took to the flanks with substantial reward as Kieran Duffy stretched the lead and McManus sending over an inspirational score. Murphy fired over a long range free, Donegal’s first score in 29 frustrating minutes, but Monaghan, breaking from defence at explosive pace, were now in charge. Dessie Mone made a number of telling incursions into opposition territory, capping one of them with a superb point from distance, and when McManus nailed his second from play, Malachy O’Rourke’s side led by four, 0-8 to 0-4 at the break. Donegal kicked five wides in the opening ten minutes of the second half, and while McBrearty pulled back a couple of points from frees, the Farney machine continued to perform with both efficiency and style, with Owen Lennon and McManus both launching spectacular points. 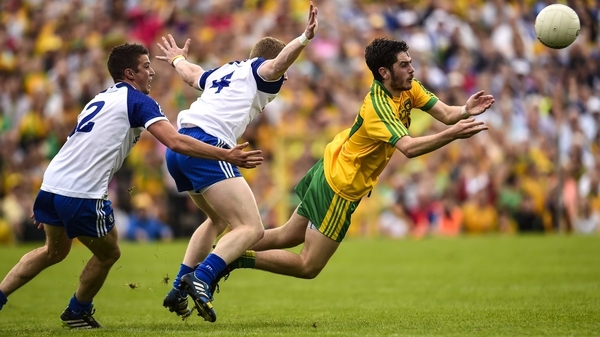 Donegal lacked shape and ideas, with speculative shots from distance sailing wide of the posts, and when they did attempt to work the ball closer to the posts, they invariably ran in to ferocious tackles from Karl O’Connell, Fintan Kelly and Colin Walshe. They attacked relentlessly, but lacked composure and were finally undone by frustration. McBrearty puled back three points, one a delightful long range effort, but many other attempts came to nothing as they racked up their 11th wide of the half. 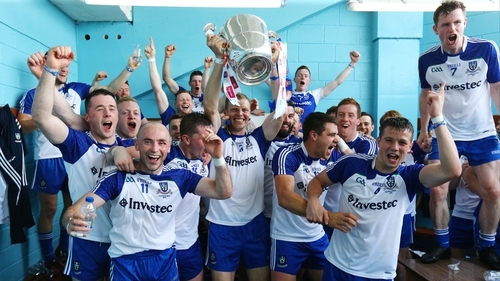 Monaghan survived heroically, every man putting his body on the line for the noble cause, and while they failed to score in the final 23 minutes, they did enough to hold on and gain revenge for last season’s defeat at the same stage. Donegal: P Durcan, P McGrath, N McGee, E McGee, R McHugh, K Lacey (0-01), F McGlynn (0-01), N Gallagher, M McElhinney, C Toye, O MacNiallais, M McHugh, P McBrearty (0-06, 4f), M Murphy (0-02, 2f), C McFadden. Monaghan: R Beggan, D Mone (0-01), V Corey, R Wylie, C Walshe, F Kelly, K O’Connell (0-01), N McAdam, O Lennon (0-01), O Duffy (0-01), D Hughes, K Duffy (0-01), D Malone, K Hughes, C McManus (0-06, 3f)).